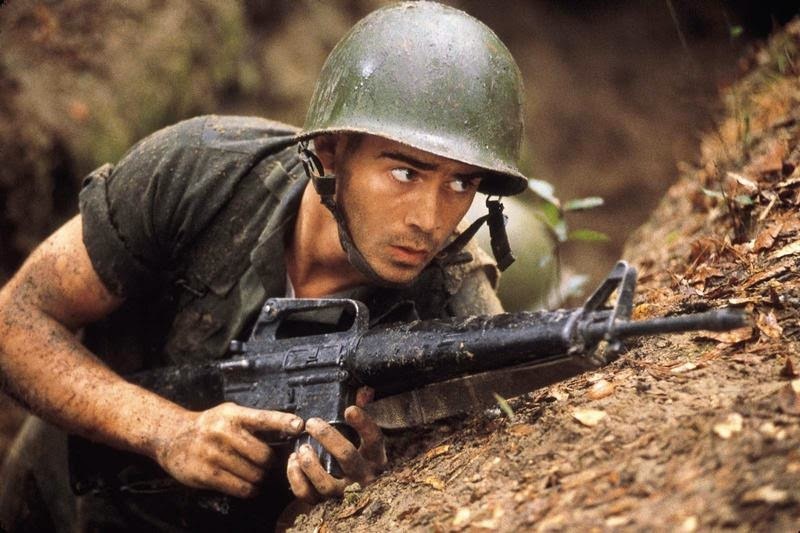 The war depicted in Joel Schumacher's "Tigerland" is fought not on the battlefields, but on the turf of a Louisiana-based instruction camp between several soldiers-in-training, whose fears of a seemingly ill-fated future fill them with anxiety strong enough to warrant sudden outbursts. Just the mere mention of Vietnam sends chills down their spines; perhaps the only thing preventing them from collapsing on the spot is the U.S. army's long-established incentive to fight for your country no matter how severe the situation is. In ways, this may be a precise reflection of the atmosphere that surrounded all the real American soldiers on their way to Vietnam in the 1960s. The only question that remains: was it all necessary? Roland Bozz, a man with reservations about the entire process, doesn't seem to think so. As he listens and watches the command of nearby officers, whose prime instruction revolves around methods of torturing information out of the enemy, he contemplates with utter confusion, "why would I want to do that to another human being?" It's bad enough that men like him were never even asked to be associated with this kind of large-scale warfare; was it also required that they operate like killing machines rather than the respectable human beings they were raised to be? Questions like these are ideal in all antiwar sentiments, but few of them are sprouted without the benefit of some on-screen documentation of the events themselves. This is what makes "Tigerland" such an irresistible and intriguing experience: rather than approaching the material under the influence of dense bloodshed and violence, it converges on the human aspect of the situation, using the presence of one benevolent individual as the driving influence behind all the necessary antiwar messages to be delivered to the audience. Confused? Then try imagining "The Thin Red Line," only with interesting characters and a story that actually cares about the situation it is in. The incarnation of Bozz is played by Colin Farrell, who gives one of the year's best male performances here. His rebellious ideas and actions go immediately noticed among the ranks of soldiers, one of whom is Jim Paxton (Matthew Davis), a man who enlisted in the army of his own free will and quickly becomes one of Bozz's closest friends. Others, however, are not too impressed by his mutinous shenanigans, particularly the officers of the camp (who shamelessly throw him around like a puppet) and a soldier named Wilson (Shea Whigham), who provokes the man at every opportunity to inflame the tension of the idea of going to war. And as the movie's characters reflect the apparent tone of real soldiers during the Vietnam War, so does the look of the film itself. Men under these pressures are likely to look at the world from muddy, discolored points of view, and the cinematography solidly captures a look that is monotonous and rather depressing, but realistic and gritty at the core. All of it is shot with handheld cameras, much like the battle sequences in Steven Spielberg's "Saving Private Ryan," but maybe that isn't so surprising. After all, it can be said that the documentary style of filmmaking adds a vivid intensity to a particular situation, especially when the movie itself deals with events that are reflective of realism but spiced up to Hollywood standards, like this one is. It can be argued, however, that the picture is just too short to fully enact a sense of pure realism: the investigation of the characters and their motivations is immediately ceased before any genuine climax is realized. The film lacks the necessary final act; events sort of just unfold one after another and then, without warning, lead to a brief closing monologue and the ending credits. Where's the sense of closure? Where is our much-deserved payoff? It looks as if director Joel Schumacher just threw together an ending rather hurriedly, simply because he was meeting a deadline. This undermines "Tigerland" to an extent, but not by much. That's because the movie is established so well in so many other aspects, from the characters to the visuals and, ultimately, to the clarity of the situation. So many antiwar movies in the past have missed the mark of greatness because they tend to over-sensationalize their war sequences. Since there is no abundant demand for those here, the movie is lucid and smooth, achieving the goal of an antiwar message without the fear of substantial battle scenes clouding its judgment.